The idea was to create a sausage that was based on the islands of Polynesia and its Asian influences. So, with that being said, we were trying to highlight the sweet, spicy and savoury notes so that the flavours would coat your mouth hitting every part of your palate. You get sweetness from the fresh mango, sour notes from the fresh lime rind, earthy notes from the Asian five spice, brightness from the green onions, this lingering heat from the habanero powder and to bring it all together the sausage is made with Atmospheres Kung Fu BBQ sauce which has notes of fresh ginger, lemongrass, garlic, hints of orange and soy. This sauce also pairs perfectly with the sausage and is available at Robbie’s Gourmet Sausages, also. When you Cook these sausages, It will fill your home with the most intoxicating smell! 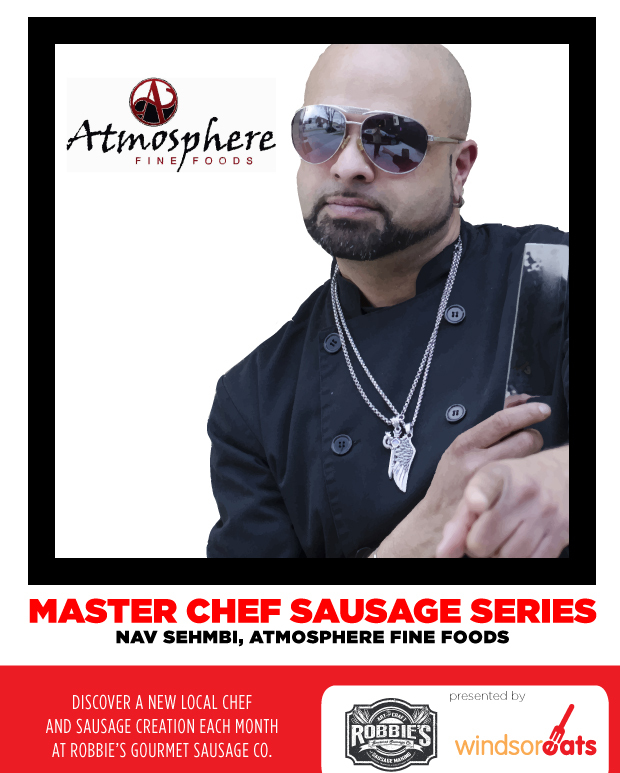 I am the chef and owner of Atmosphere Fine Foods which is a customized catering company. We also specialize in food products and sauces. Our products are available at Robbie’s Gourmet Sausage Company and range from vegetarian foods such as our vegan burgers and our award winning beef burgers, as well as our line of sauces among. Our catering is customized. We speak to our clients get and idea of what type of food, party, and event they are having and devise a menu. We also offer food classes and catered drop offs. You will see us doing pop ups throughout the city and food at wineries. I am the 2010 Windsor Harvest Moon soup champion, Winner of Food Networks TV show “Dinner Party Wars”, 2013 Windsor/Essex Burgerfest Champion for best burger, and featured in the new Best of Windsor cookbook. I would have to say first my parents as both my mom and dad are amazing cooks. Being from an East Indian background, you were taught about the importance of spices and how certain spices paired together would benefit your body and health. Having almost 80% of my family as vegetarians, eating a lot of that food during my youth taught me that as much as I love meat, there are many beautiful and delicious alternatives. Later, when I started to take cooking seriously, I met a man who turned out to be one of my mentors. Miguel Horbatiuk (A.K.A. Mr.H) came into my life with a completely different look on food. As I was always into spices and sauces, he taught me about the simplicity of food and how to enjoy food for what it is in its most true form. His background being Argentinian, he taught me about different methods of cooking, grilling, using live uncontrolled wood fires, eating meats in their most true form just with a little salt and pepper, he broadened my range of food and my palate. Lastly I would have to say my biggest influence is this world and its amazing cultures, because without them, lets face it everyone would be the same. Wouldn’t that be boring? My influence for this sausage was basically simple. It’s what I love to eat. Bold flavours, sweet, heat, savoury notes. Rock and roll in your mouth, take a bite and you just can’t stop dancing its so good! I think what I was trying to achieve is a different way of looking at a sausage. Many people think sausage and they think, buns, mustard, onions and so on. I wanted them to look at it as a vehicle for creating amazing dishes. 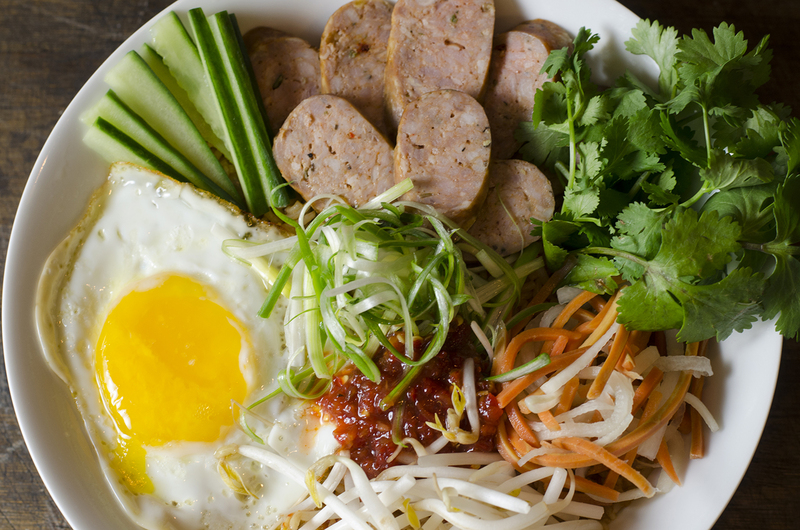 This sausage not only can be enjoyed on a bun, but think stirfrys, noddles, flat breads, grilled pineapple, salads, endless possibilities. Man! You can’t ask me that! I don’t think any chef can actually answer this question. This all depends on what day it is, what I’m making, and how I feel. But if I think about it, I love using Five Spice, Cumin, Garam Masala, good salt, black pepper and a range of fresh chilis and powders. But again it all depends on the day. Who doesn’t want to be a rockstar? This recipe for Atmosphere’s Rockstar Rice Bowl not only looks visually stunning, it tastes even better.